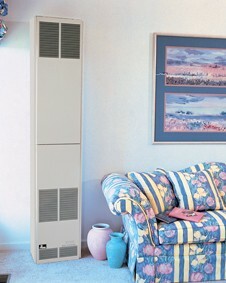 Heating larger areas is convenient and economical with Empire's Direct Vent Units. Delivering ample, room-filling warmth, each furnace is stylishly crafted and fits against an outside wall. Automatic Blower Included with all units. Uses only one square foot of floor space. Wall Depth: Min 5 1/2", Max 13"
Vent Wall Opening: 7 1/2" dia. All installation and service of these units should be performed by a qualified installation and service agency including the use of the installation and service manuals which are specifically intended for use by a qualified installation and service agency.